Imagine too that in this same opal jewelry store, you are NOT going to be presented with things that are made in a laboratory but are rather directly from mother earth, enhanced only by the process of opal cutting and polishing. A quick search of the Internet, even in famous stores such as Amazon, reveals that probably 90% of opals on display are synthetic, and sadly are marketed in such a way that, if you don’t read the fine print, you will mistake them for real. But at opalmine.com you can feel safe in the knowledge that not one of the opal pendants or opal rings on display is synthetic. All are natural opals from Coober Pedy, Lightning Ridge, or the Western Queensland opal fields, Australia. One of the main reasons we can offer this guarantee is, not only are the opals natural but unless stated clearly, they are ALL from Australia and if you do the research you will find that this country is the only source of opal that you can trust not to break or fade. Other unique aspects about our store are the fact that much attention is given to making sure you get the right after sales service. For example, if you buy a ring, you need to know that it will fit the finger of the person who will wear it. We can either control this process here or give advice to your jeweler wherever you live. We even show you how to find the size yourself if you don’t want to search for a jeweler who will do it. At opalmine, we have something for everyone. If you can only afford $20 or so, in the opal bargain department we have some nice little opal pendants in gold plate for as little as $15 and that includes the shipping. 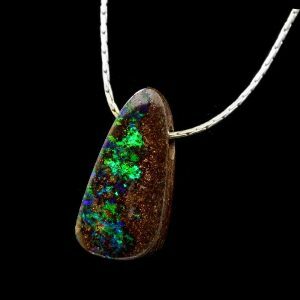 If you can afford around $100 we have lots of opal pendants with matching earrings in sterling silver or gelded finish. 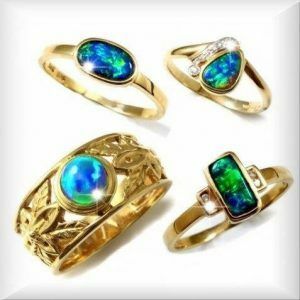 If you can afford a little more, there are opals for a few hundred dollars up to many thousands of dollars. Opal bracelets, opal brooches, opal earrings, with rings for men or women. Opal tie tacks and tie bars. Opal cuff links and belt buckles. Girl’s if your guy likes to dress up with a tie and long-sleeved shirt, nothing looks more stunning that a brilliant multi-colored opal. Best of all you can feel safe in the knowledge that guarantees for all opals sold at opalmine.com don’t run out in one year. We have a perpetual lifetime guarantee on everything sold. Customers get back to us after more than ten years if they need help with an opal they have bought. These comments are easy for us to say and ‘self-recommendation is no recommendation’ so we invite you to take a look at just a few of the tens of thousands of comments people have made about us over the years, verifying these claims. Most of all enjoy the feeling of wearing a stunning multi-colored opal ring and think about how it will look on your finger or as a pendant around your neck…Just Beautiful!